The phytoplankton isn't hazardous to humans, but has caused fish die-offs in other parts of the world and could be connected to a $250,000 loss of clams in Brunswick. State authorities are warning shellfish harvesters and others of a “massive” algae bloom in Casco Bay that can create low-oxygen dead zones, potentially lethal to fish, shellfish, lobsters and other marine animals. The full extent of the bloom is unclear, but the state’s warning coincides with a sudden die-off of soft-shell clams in Brunswick. About 14 acres of productive clam flats in Maquoit Bay are almost completely denuded of adult clams, a loss of up to $250,000 to local harvesters, Brunswick Marine Resources Officer Dan Devereaux said in an interview Tuesday. Mud in the area is dotted with clam holes filled with dead clams and black water that Devereaux believes is depleted of oxygen. Despite the timing of the die-off, Devereaux is not convinced it is connected to the Casco Bay bloom. The impacted area is limited, and only one type of shellfish appears to be affected. The Department of Marine Resources said Tuesday that it is monitoring an unusual bloom of Karenia mikimotoi, the first time a harmful bloom of this phytoplankton has occurred in Maine waters, as far as the state knows. The bloom is not hazardous to humans, but is associated with fish deaths in Asia, Europe and Alaska. Thick, brown-green clouds of algae were clearly visible off the docks of South Port Marine in South Portland on Tuesday afternoon, completely obscuring the harbor bottom. 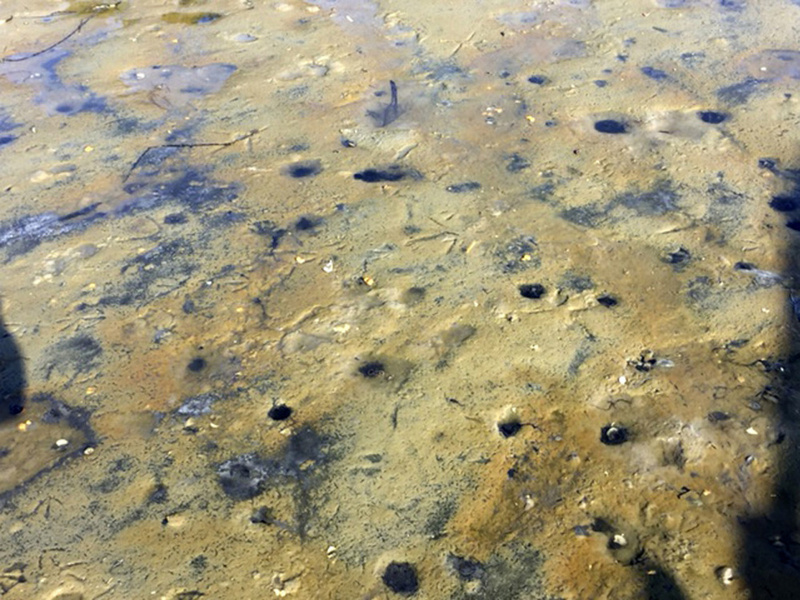 Recent tests showed areas around the marina had some of the highest concentrations of phytoplankton, according to Kohl Kanwit, director of the public health division at the Department of Marine Resources. State officials regularly monitor for other types of harmful algae blooms, like red tide, that can contaminate shellfish and cause illness or death in humans. However, it doesn’t have experience with this type of phytoplankton and is monitoring the situation closely. “We are not able to predict if a low-oxygen event will occur or if the current levels of Karenia mikimotoi will have wide-scale negative impacts on shellfish, but we are very concerned about these possibilities,” the department’s public health division said Tuesday. Maine’s commercial fisheries were worth $721 million last year, and any threat to marine life could have serious consequences for the state’s economy. The department recommended seafood dealers who source storage water from affected areas come up with contingency plans to protect their product. Matt Moretti, owner of Bangs Island Mussels in Portland, said he and lobstermen friends started seeing brown tinted water in parts of Casco Bay in the last few weeks and alerted the department. So far, the bloom seems to be concentrated in the Fore River, Portland Harbor and parts of Harpswell, Moretti said. While he isn’t worried the bloom will hurt his mussel farms near Chebeague Island and Falmouth, the scale of the bloom is unsettling. While the algae’s toxicity is not fully understood, scientists believe the die-offs are caused by a low-oxygen environment created by a combination of the bloom itself and a toxin carried by the phytoplankton, the department said. Shellfish like mussels, clams and oysters, fin fish and crustaceans like lobsters could be affected. “I would say this is another unprecedented occurrence in New England,” said Kate Hubbard, an expert on harmful algae blooms with the Florida Fish and Wildlife Conservation Commission who is assisting the Maine Department of Marine Resources as it monitors the bloom. Single-celled phytoplankton exist naturally in the environment, but under the right conditions can grow quickly. In the case of an intense bloom like the one in Casco Bay, millions and millions of cells are concentrated in one area. Respiration by those cells and decomposition after death depletes dissolved oxygen in the water and can create dead zones of low or no oxygen where other organisms can not survive. Fish die-offs have been reported during blooms of Karenia mikimotoi in Hong Kong, Australia, Ireland, Japan, Korea and Alaska, among other areas. Maine authorities are asking anyone who observes a die-off of marine organisms in the Casco Bay region to report it to the marine patrol.